The Hag's Cure is an apothecary in Markarth owned and operated by Bothela. To find it, enter the city gate and turn left, turn right at the first bridge, turn left before going up the stairs at water wheel, cross the bridge, and ascend the stairs to the right, then to the left. There is a juniper berry tree outside, at the top of the stairs leading up to the store from Cidhna Mine. 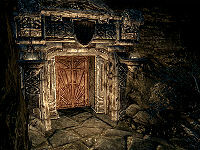 Like most buildings in Markarth it is built back into the hill and is of Dwemer design and style. Upon entering there is a short corridor leading to stairs down into the store. It consists of a stone counter built across in front of the east wall with a wall to the left separating it from the entry stairs with a few barrels of ingredients and food sacks around the building. On the counter are several ingredients and potions that are displayed merchandise along with a bunch of tundra cotton, a single septim, a couple of plates, a cup and a bowl. On the wall between the stairs and counter is a basket containing a cabbage. While under the counter is the business ledger and a copy of the Alchemy skill book Herbalist's Guide to Skyrim. Behind the counter against the east wall is a set of shelves holding a red apple, a gourd, a plate and potato as well as several items of displayed merchandise. To the right of the shelves is a small unit holding a copy of The Firmament and a bowl, with two racks hanging from the ceiling above holding a rabbit, a garlic braid, two bunches of elves ear and a bunch of frost mirriam. Against the south wall, in an alcove is a fireplace with an L-shaped sideboard to the right of it. On the sideboard is a platter holding a goblet, a bottle of alto wine and a pheasant breast, with a steel dagger and bowl beside it. To the right still against the south wall, in a second alcove is an alchemy lab. Another alcove is to the west with a large stone table holding various displayed merchandise items. In the middle of the west wall is a flight of stairs up to their sleeping quarters, with a food barrel to the left and on top of it is a piece of bread and cheese. To the right of the stairs is a set of shelves filled with displayed merchandise, in addition to a tomato and potato. There is an unlocked chest in the northwest corner with a cooking pot on a stand between the shelves and chest. There is a small square stone table against the north wall with two wooden chairs pulled up to it. On the table is a bottle of alto wine, a bottle of wine, a baked potato, a loaf of bread, a red apple and a goat cheese wedge. With another set of shelves to the east separating the entry stairs from the table. These also hold displayed merchandise. The stairs to the west lead directly into a twin bedroom containing a dresser to the south as you enter containing clothes with a steel dagger on top. There are two owned single beds opposite each other, one coming out from a curved south wall and the other coming out from a curved north wall. To the left of the one to the south is an end table with an apprentice locked strongbox and a copy of Herbane's Bestiary: Ice Wraiths. To the left of this is a round wooden table and chair, with a bottle of alto wine, a bottle of wine and two loaves of bread on top. To the west is another curved wall with a raised area holding a bowl and plate, with a wash basin to the left and on the floor is a basket containing two gourds and a potato. At the foot of the bed to the north is an unlocked chest. While to the north as you enter the room is an end table with a tomato and medium coin purse on top and a basket containing a few pieces of cheese on the floor beside it. Bothela gave the shop its name because she thought "hag" suited her in both its sense as an epithet and its sense as denoting an old woman who dabbles in mysterious and misunderstood magic. There is a Loot shadowmark to the bottom left of the entrance door. There are several alchemical ingredients, potions, and poisons found around the store. If anything happens to Bothela, her assistant, Muiri, will take over running the store.